Our wonderful foundation started with a female from Maureen Andersen of Keikewabic Kennels in Dryden. Two years later our foundation male Yukon came to our home from Pam Kovac of Tundra Kennels in Thunder Bay. We value our long time relationship with our mentor friend Maureen Andersen who is always there for us with answers to any questions about Malamutes and a joke for the day. Together "Akela" Ch Keikewabic's Akela CAM & "Yukon" Ch Tundra's Keikewabic Yukon have given us a legacy of great dogs with wonderful temperaments, no health problems, longevity, effortless working/showing movement and special personalities. We have bred many Canadian Champions, Best in Specialty, Best Puppy in Specialty, Group Placing & Best of Breed winners. Most of all, our puppies have been placed in great homes with caring owners all over the world. We continue to be successful at the shows with Group placing and Best of Breed wins with our up & coming stars. 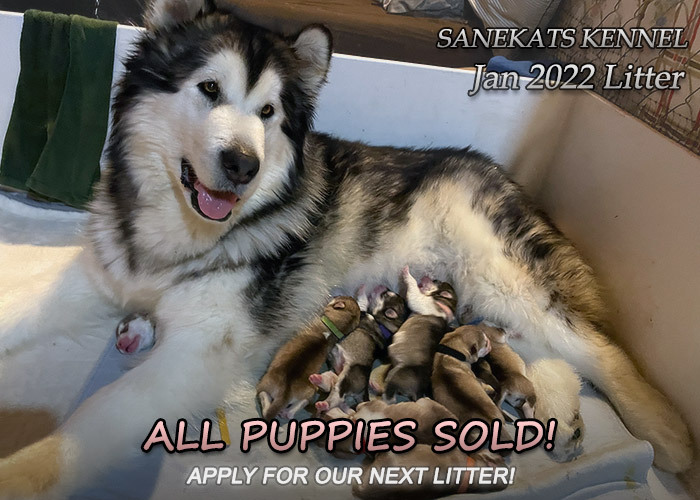 After visiting our site, you find that you are interested in adding a Sanekats puppy or adult for adoption to your family. Please take time the to fill out our Puppy Application/Adoption form. Pictures, images and stories of our Malamutes on this site are a tribute to some of these dogs who have made all of our lives better in many ways. - All Feb puppies sold. Next planned breeding late summer 2019. - All puppies from June litter sold, Next litter expected Dec/Jan 2018/19. - We are very sad to announce the passing of our Kenai. Though she will be missed dearly by all, her legacy will be carried on by the many generations she queened. - Buddy received his first points at Red Deer show. - We are very sad to announce the passing of our Odin. Though he will be missed dearly by all, his legacy will be carried on by the many generations he sired. - Suka Ch Sanekats Regina Big Boy owned by Maureen Andersen finished CKC Championship in Thunder Bay Ontario. @ NOWDA specialty.